The Hoagland Group is interested in the solution behavior of polymers, especially on the unique dynamics of polymers in confined spaces and the complexities arising due to charged groups on polymer properties in solution. Our current group research focuses on two main areas. The first is polymer dynamics in confined spaces. Various nanopatterning methods are being employed (colloidal templating, lithography) to create well defined pore structures. Fluorescently labeled polymers are then trapped in the novel structures to probe their behavior in confined geometries. Techniques such as optical microscopy are used to track polymer diffusion. This general procedure is being utilized to study many topics in polymer science including polymer chromatography in wicking flows, entropic barrier separation mechanisms and polymer correlation times based on size in porous media. The second focus of our research group is on the rich solution behavior of polyelectrolytes in the presence of charged species. Counterion condensation is being studied with novel ionene polymers which have controllable charge densities and tunable charge spacing. Another area of active research is the complexation of surfactants and block copolymers with a single ionizable block. Intricate structures are formed in solution such as hexagonally packed spheres with correlation lengths on multiple length scales. The emergence of ionic liquids has added a unique opportunity to study polymer behavior in solvents of seemingly pure ions. 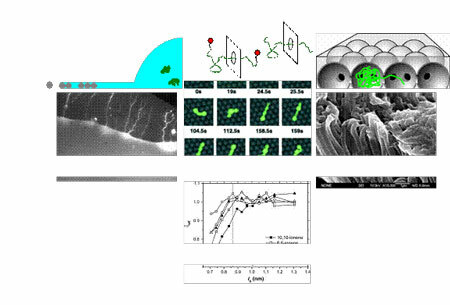 Solution behavior of polyelectrolytes and the gelation dynamics of polymers in ionic liquids are few of the prominent topics being investigated using ionic liquids as a solvent.